Because I am in this production, MEMPHIS The Musical, at Croswell Opera House is being reviewed by guest reviewer director/choreographer/producer Patricia Mazzola. Thanks Patty! I had the fortune of seeing the opening night performance of MEMPHIS the Musical at Adrian’s Croswell Opera House. Based loosely on real-life Memphis DJ Dewey Phillips who played black blues and R&B for people of all races to appreciate, taking enormous chances in the segregated south of the fifties. You, too, will be taken by this production. The show has it all! The performers are so good you truly get lost in this story. Be ready to experience surprise, anger, laughs, love and genuine joy. There are excellent performances by Dan Clair as Huey Calhoun and Tatiana Owens as Felicia, but supporting roles are just as strong. Lydia Schafer plays Huey’s mother, and it is a gem of a musical comedy role expertly played. Derrick Jordan sings a remarkable Delray, Felecia’s older, protective brother. There’s a fantastic dance number from Dom Glover as Bobby (“Big Daddy”) and Anthony L. Isom sings a stirring “Say a Prayer” as Gator. The choreography is strong and prominent, featuring a half-black half-white singing and dancing ensemble cast. This is the type of dance you rarely see on local stages and director/choreographer Debra Calabrese keeps everything flowing at an exciting pace. The audience eats it up and you can quickly see why this musical won all those Tony Awards a few years ago. It is an exciting evening of musical theatre, but one that has a strong message to convey. The storyline draws you in and keeps you there — as it explores the birth of rock and roll and its rhythm and blues origins in Memphis’s black Beale Street clubs. Through a series of coincidences, Huey manages to secure a job at a popular radio station (Ann Arbor’s own Ron Baumanis plays the station manager as a “gruff, obscenity-spewing teddy bear” — credit to Wendy Wright for that one). When Huey falls in love with black singer Felicia, complications ensue and the relationship faces obstacles in both the white community as well as back on Beale St. Just as current as today’s racial tensions and rebellious music preferences, it’s the younger folks and teens who take to the new beat; and by the time the musical reaches its electric final number, “Steal Your Rock and Roll,” everybody within the walls of this majestic theatre are with them. Praise to Dave Rains and his 9-piece onstage orchestra for some truly excellent musical work. Throughout the evening, the show’s driving force is the original musical score. Several times I thought the story hit the highlight, only to be taken further. It is not your typical boy-meets-girl musical. You won’t want it to end and will find yourself dancing and singing your way to the car. You’ll be hard pressed to find any local production of this musical with these production values. 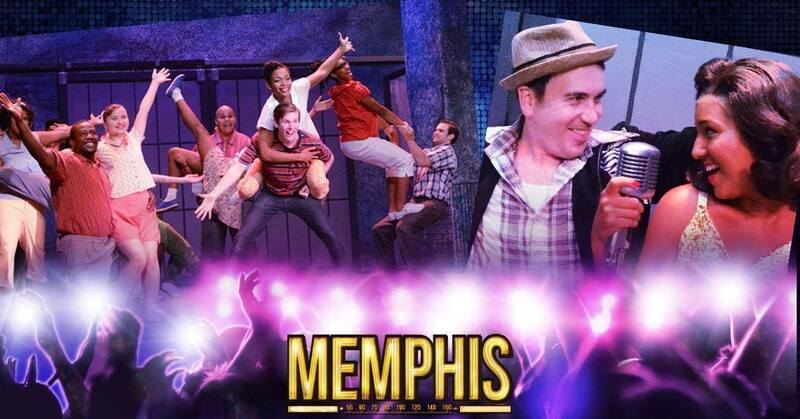 Memphis continues at the Croswell Opera House through August 23rd. croswell.org or 517-264-SHOW for tickets. Don’t miss it!